I know it doesn’t look like it much, but I really do try to cook and eat healthily! Lately though, I’ve just been feeling a little indulgent. I’ve had too many sweets, way too much cheese, carb overloads. Ahh, well…. I guess after the new year I may get back to being good. But for my last recipe of 2010 lets make it a great one! 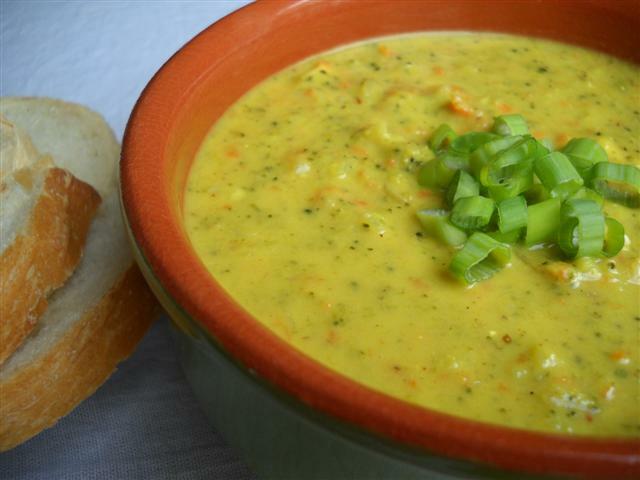 A delicious creamy, cheesy soup! My favorite soup, actually. Cook the broccoli and grated carrot in the water or veg broth. I just this year discovered Imagine “no chicken” vegetable broth and I think its really good. Before that I would use water, and sometimes to flavor the water more, boil along onions and garlic and some dried herbs, its your choice. Cool and blend together lightly, but not too much. I like to still have some cute little flowerettes in the soup. Heat butter and sautee the garlic and onion till translucent. Sprinkle flour over it, while stirring, trying not to form lumps. You may need to use a whisk. Let the flour cook for a few minutes while stirring, so it does not taste raw. Stir in the milk slowly, while stirring constantly. Then add the broccoli. Bring to a simmer and add the mustard, turmeric, chili powder, hot sauce/chili paste, pepper, salt, pinch of freshly grated nutmeg. Once it thickens (you may need to add extra milk or broth if its too thick) turn off the heat and stir in the cheese until fully melted. Lastly add a dash of rice vinegar to perk it up (optional). Measurements are approximate, because I didn’t really measure and you may like more or less. Its nice with a garnish of shredded cheddar or chopped spring onions and a couple slices of crusty bread (italian or sourdough for example). Enjoy! I made this a week ago, and wish I had a bowl of it right now!